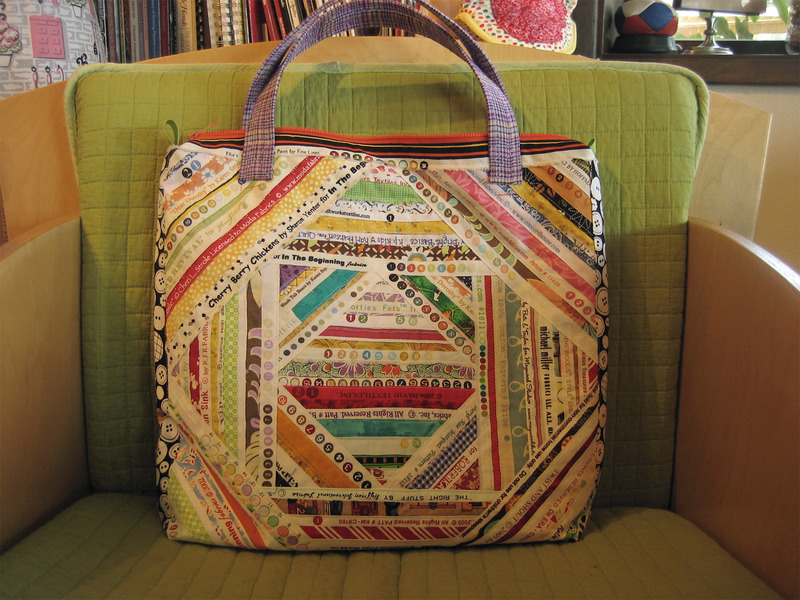 After a month break from posting ( life here is days full of teenager-ing and sewing – seems like about a 50/50 split ) and I only have a little to say. Sort of sad, don’t you think? I made a trip to the big city to surprise my sister on her birthday. She ( and my other sis and my mom ) did it to me, so returning the kindness seemed the thing to do. I was successful, showing up with mom at her house while she was gone. We set the table for lunch and when she and her husband drove in we hid. Mom had baked a strawberry-rhubarb pie, and we had deli sandwiches and champagne. It was great to sit and talk for hours. There should be a pic of us here, but it came out the usual (bad) way. I do have one of an inanimate object which does not have it’s eyes closed and an expression which looks like I could be drooling. 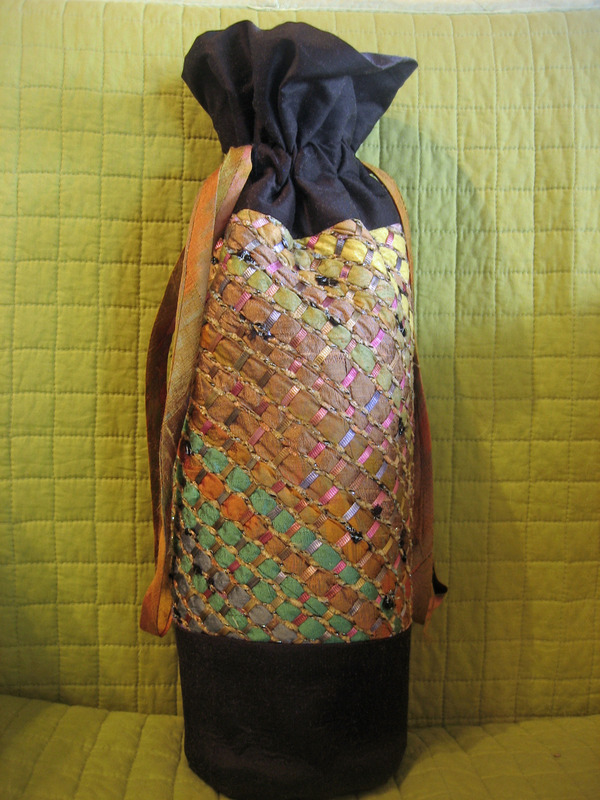 I made her this wine bag: It started out as a project I began years ago of silk tubes that I sewed, and ribbon and yarn, then hand wove into a vest a long time ago; after finishing one front I gave up and put it away. I found it a while back, and decided it needed a purpose rather than languishing in a drawer for eternity. Combined with some black silk and quilted lining it came out beautiful. I also made a bag for my Mom for Mother’s day. Can you have too many bags? I’m beginning to wonder. 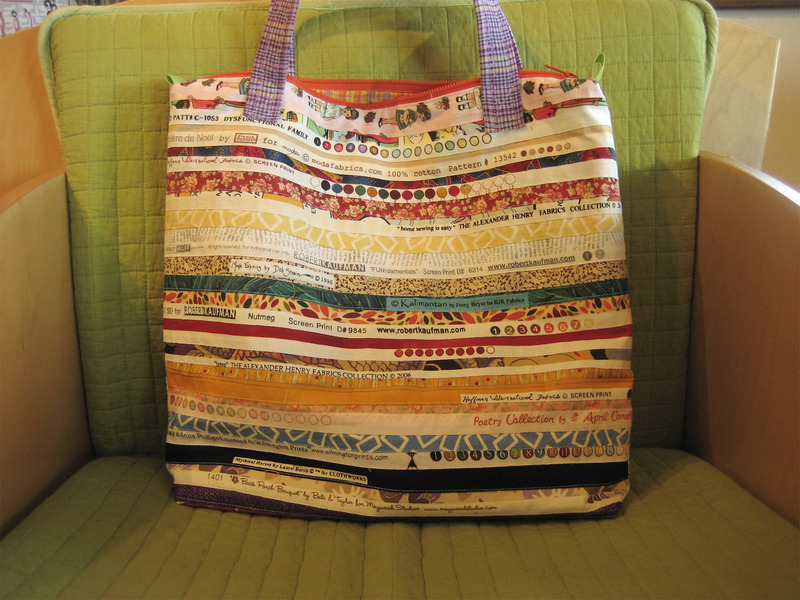 I thought this would make a nice tote for her to take to quilting. It is bright and colorful and it was fun to do. I spent time with my other sister talking with someone about a ‘real’ website. And a facebook business page for redclothespin. So much to think about and with a big ‘to-do’ list to go home with. It was a nice break from all the duties of home, which gave me a bit of a recharging that I needed. It does seem a little weird to be doing so much yet think that it just wouldn’t be interesting to anyone else. I’m in the same boat. Yeah! for the awesome visit! Love you Mom. These bags are so unique its a surprise your not bombarded with orders for them .